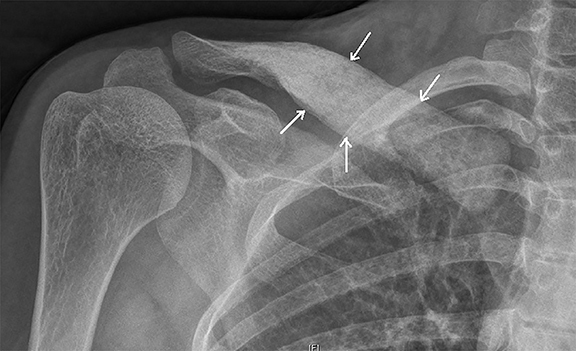 A 26-year-old woman presented with a 5-year history of swelling and pain over the right collar bone. She also complained the similar swelling and pain over the mid left thigh for a year. There was no history of fever, loss of weight or other co-morbidities. On physical examination, there was tenderness and diffuse homogenous hard swelling over the right clavicle sparing the lateral end. Local examination of left thigh also revealed the localized tenderness over the mid part with no swelling or redness. Laboratory investigations were notable for no evidence of hematologic malignancy or infection. She underwent plain radiographs of both the right shoulder region, including the clavicle, and left femur. Plain radiograph of the left femur revealed segmental mid diaphyseal concentric cortical thickening and sclerosis also involving the medullary cavity (Figure 1A). Radiograph of the right clavicle and shoulder joint revealed marked sclerosis of right clavicle (Figure 1B). 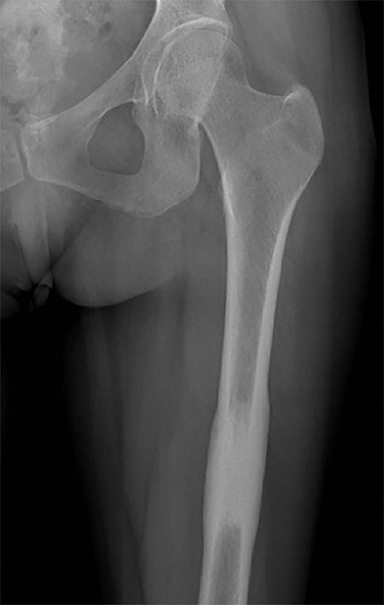 Based on the radiographic findings a diagnosis of chronic recurrent multifocal osteomyelitis (CRMO) was made. 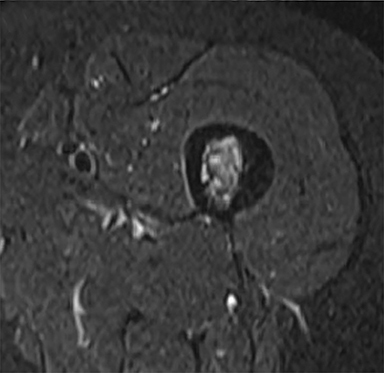 Subsequently, patient underwent whole body bone scan and magnetic resonance imaging (MRI) of left femur as seen in Figure 2 and 3 respectively to look for other lesions, extent of involvement and to rule out neoplastic possibility. Typical radiographic imaging appearances are of multifocal synchronous or metachronous lytic or sclerotic or rarely mixed lytic-sclerotic lesions in metaphyses of long bones and the medial end of clavicle. Other sites like shoulder girdle, spine, pelvis, and sacroiliac joints, the anterior chest, metatarsals, metacarpals, phalanges, tarsal bones, mandible have also been reported.5 Disease may be bilaterally symmetrical or multifocal at presentation. The bone scintigraphy and MRI are helpful in detecting the multifocality of lesions of CRMO. 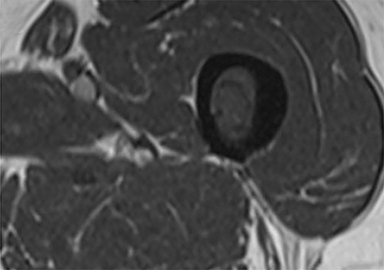 Whole body MRI especially the fluid sensitive fat-saturated sequences are quite sensitive and specific in determining the active disease and extent of the lesion.6 CRMO remains diagnosis of exclusion with radiologists at times being the first to suggest the diagnosis based on pattern and distribution of imaging features. A large number of drugs and treatments have been tried with variable success in recurrent or unresponsive cases. Nonsteroidal anti-inflammatory drugs (NSAIDs) have shown variable benefit in CRMO therapy and are considered the best choice for treatment.7 Other options include oral corticosteroids, bisphosphonates, sulfasalazine, and methotrexate.7 Antibiotics do not seem to be helpful. The foremost objective of this case is to highlight the importance of combination of imaging modalities in diagnosing CRMO and to exclude the close clinical and imaging differential of infectious osteomyelitis and malignancy. The distribution of bony lesions can aid diagnosis, with lower limbs and clavicles commonly affected as seen in this case although the diaphysis involvement is relatively uncommon. Both the radiologists and clinicians should be aware of its clinical and imaging presentation to avoid morbidity associated with more aggressive treatment. Surendra G1, Shetty U. Chronic recurrent multifocal osteomyelitis: A rare entity. J Med Imaging Radiat Oncol. 2015;21. Iyer RS1, Thapa MM, Chew FS. Chronic recurrent multifocal osteomyelitis: review. Am J Roentgenol. 2011;196:87-91. Carr JA, Cole WG, Robertston DM, Chow CW. Chronic multifocal osteomyelitis. J Bone Joint Surg Br. 1993;75:582-591. Paller AS, Pachman L, Rich K, Esterly NB, Gonzalez-Crussi F. Pustulosis palmaris et plantaris: its association with chronic regional multifocal osteomyelitis. J Am Acad Dermatol. 1985;12:927-930. D. Cyrlak and M. J. Pais. Chronic recurrent multifocal osteomyelitis. Skeletal Radiology. 1986;15:32-39. Kennedy MT, Murphy T, Murphy M, Laffan E, Connolly P. Whole body MRI in the diagnosis of chronic recurrent multifocal osteomyelitis. Orthop Traumatol Surg Res. 2012;98:461-464. A. G. Jurik. Chronic recurrent multifocal osteomyelitis. Seminars in Musculoskeletal Radiology. 2004;8(3):243-253. Panwar J. Chronic recurrent multifocal osteomyelitis. Appl Radiol. 2016;45(5):40-41. Prepared by Dr. Panwar while a Professor in the Department of Radiology at Christian Medical College in TamilNadu, India.